Steve and I started our little vegetable patch last summer, and there are times when I really wonder if the hassle of growing vegetables is really worth the sacrifice of some good summer play time. The weeds just keep on coming, and it’s such a thrash in the spring, dancing around the last thaw before getting the seedlings and seeds all in. And the bunnies! Sigh. 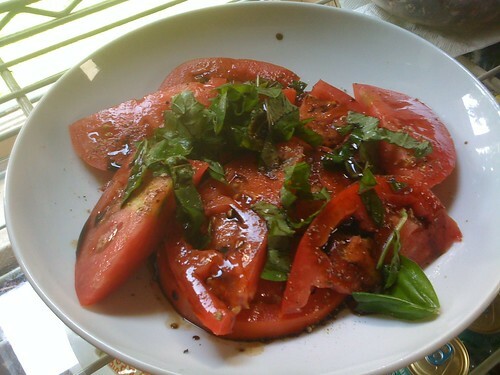 But one bite into one of our ripe beefsteak tomatoes, and I wonder no more. I haven’t eaten a commercial tomato in two years! And the glossy, peppery basil, and the fat, sweet carrot! I am amazed, and a little bit proud. I managed to nurture something from seed to maturity, and recognize even more value in my food.